The journal's 2018 inaugural issue and the first since the realization of the new partnership is already live on the journal's new website. The articles are brought together under the theme "The Austrian School of Economics: Its Reception in European Countries" and have been briefly presented at the Second World Congress of Comparative Economics "1917-2017: Revolution and Evolution in Economic Development" held in St. Petersburg, Russia, in 2017. 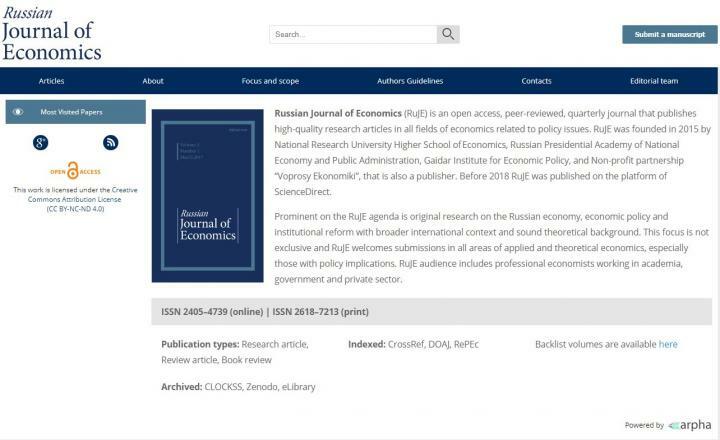 "I am pleased to see our new collaboration with Russian Journal of Economics coming to fruition, not solely because it looks great in our growing journal portfolio, but also for the amazing opportunity for ARPHA," says ARPHA's and Pensoft's founder and CEO Prof. Lyubomir Penev. "I am certain that we can contribute a lot, so that we can together oversee the further progress of this excellent journal." "The task of the project is to create a competent international information resource for academic economists, expert and business communities, devoted to macroeconomic policies in different national contexts, including the Russian one, institutional issues and comparative analysis. The high technological base of ARPHA platform gives all the necessary opportunities to realize the strategic goals of Russian Journal of Economics," says Andrey Kotkovsky, Director at NP Voprosy Ekonomiki. Among these is the prominent fast-track and convenient publishing workflow provided by the platform. It allows for each manuscript to proceed all the way from submission and reviewing to dissemination and archiving without ever leaving the platform's singular collaboration-friendly online environment. RuJE's articles are also to be archived in CLOCKSS and Zenodo, in accordance to ARPHA's standard practices. What's on in the new issue? The Italian perspective on the Austrian economic ideas are given in an article authored by Prof. Antonio Magliulo, University of International Studies of Rome. He explores two periods – before World War II, as linked with Menger's influence – and compares it with Hayek's. The editorial by Prof. Vladimir Avtonomov looks back on the so-called Marginal revolution in economics from the 1870s. Thus, the reader obtains a firm grasp on the origins of the three European schools of economics with a focus on the Austrian one, before tracing the economic environment on the Old Continent well into the 20th century through the pages of the journal's special issue. NP Voprosy Ekonomiki is the publisher of the journal Voprosy Ekonomiki (Issues of Economics). Launched in 1929,Voprosy Ekonomiki is one of the oldest and the most influential academic journals in Russia. It is indexed in Web of Science, Scopus and other bibliometric databases. RuJE is a new project of the publisher carried out together with three Russian leading research centers. It is intended to simultaneously acquaint the world with the most recent trends in Russian economic science and provide a discussion platform for both Russian and foreign specialists interested in the processes taking place in Russian and global economy and their interrelation. ARPHA is the first end-to-end, narrative- and data-integrated publishing solution that supports the full life cycle of a manuscript, from authoring to reviewing, publishing and dissemination. ARPHA provides accomplished and streamlined production workflows that can be customized according to the journal's needs. The platform enables a variety of publishing models through a number of options for branding, production and revenue models to choose from. Pensoft is an independent academic publishing company, well-known worldwide for its innovations in the field of semantic publishing, as well as for its cutting-edge publishing tools and workflows. In 2013, Pensoft launched the first ever end to end XML-based authoring, reviewing and publishing workflow, as demonstrated by the Pensoft Writing Tool (PWT) and the Biodiversity Data Journal (BDJ), now upgraded to the ARPHA Publishing Platform. Flagship titles include: Research Ideas and Outcomes (RIO), One Ecosystem, ZooKeys, Biodiversity Data Journal, PhytoKeys, MycoKeys and many more. Andrey Kotkovsky, Non-profit partnership "Voprosy Ekonomiki"